I have a girlfriend (Hi, Alisha!) who I'm often out shopping with and her eyes will light up when we enter certain stores, "Oooooh! SAMPLES!!!" And whenever I advise her of a new beauty product (as I am wont to do), she will reply very sagely, "Well, we'll have to go see if we can try some first!" I tease her pretty mercilessly (as I am also wont to do), but really, who doesn't love a freebie? If nothing else, those itty bitty baby tubes and pots make my product whorin' Grinch heart grow three sizes. 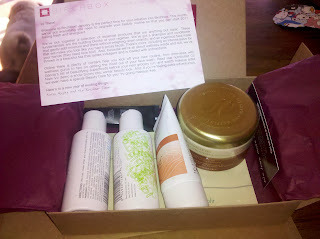 So Birchbox was first brought to my attention by my little sister (and a hi to Caroline! ), and before she had the time to respond to my "what is it?" message, I had already Googled and signed up. I was on pins and needles waiting for my adorable lil' pink box to arrive (oh yes, the outer wrappings are pink and the whole shebang is packaged beautifully!). 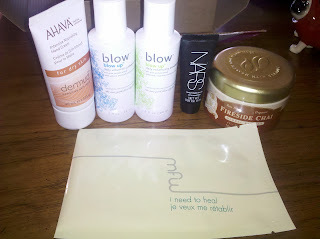 The Face Shop sheet mask in "I need to heal"
As I write this, I'm not quite slip-sliding around the keys with the dreamy delicious Ahava Mud hand cream on my grubby little paws. I'm not much for hand cream, but this little tube could make a believer outta me... it's a thick cream, with a bit of a soapy fragrance that I'm not entirely in love with but can definitely stand. It absorbs reasonably quickly and really does leave your skin (elbows, too!) soft and lovely. Further Birchbox bonuses include their very user friendly site where you can purchase full-sized versions of the sample products (with free shipping!) and earn points from writing reviews and making purchases (100 loyalty points = $10 toward purchase). So while the reviews on the contents of this first Birchbox are definitely mixed (thumbs down for me personally on the shampoo and conditioner), the service itself gets an A+, and I cannot WAIT for my next box! 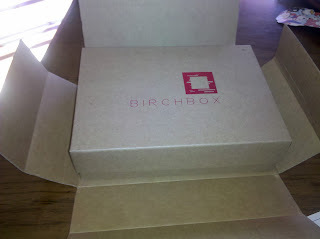 To get your own, head to http://www.birchbox.com/ and check it out. You'll be asked to answer a quick survey about your complexion and beauty habits (they try to tailor your box to your preferences) and then the mailman stalking begins!